The UN Peace Day on Friday, September 21st occurs this year in the context of the 70th anniversary of the Universal Declaration of Human Rights. The UN Secretary General points out that the Declaration: “…recognizes the inherent dignity and equal and inalienable rights of all members of the human family”. The implication is that in those circumstances where there is mutual recognition of the ‘inherent dignity of all…’; peace prevails. 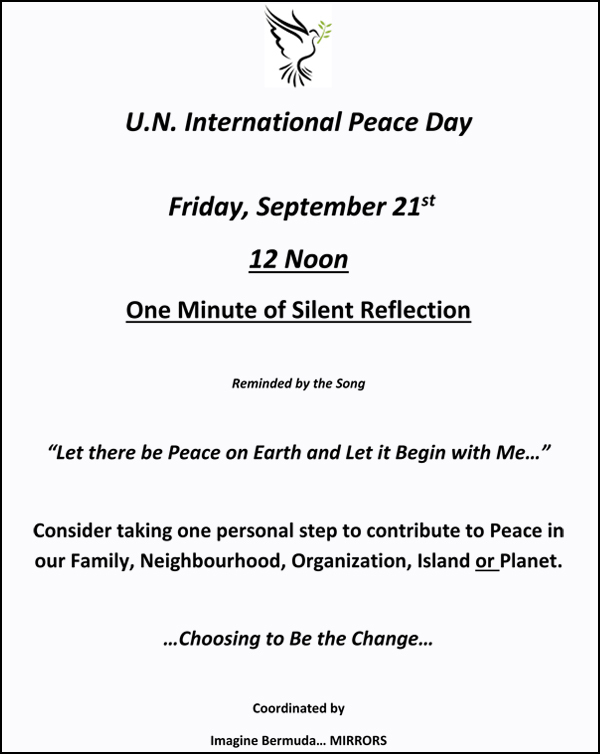 Bermuda residents are invited to join in “Peace Day” by observing one minute of reflection at noon on Friday – participating in the ‘Global Wave’ across the time zones. Residents are also encouraged to reflect on ways to contribute to peace in, either our family, organization, neighbourhood, island or our planet. Communities experience peace when enough people work towards that end. Amongst those champions of peace in our island is retired Police Superintendent Campbell Simons. A former Cup Match captain, Simons played a key role in assuring peace during the historic crisis of Spring 1981. His involvement in sport kept Superintendent Simons grounded in the community. This was reflected in his approach to his formal police responsibilities. During the last week of April 1981, tensions grew in the community, as a strike of Government blue-collar employees, persisted. Some taxi drivers mounted a picket of the Airport, in solidarity with those strikers. A few of us organized a Strikers’ Family Support Committee with the assistance of Canon Thomas Nisbett and Rev Larry Lowe, collecting funds and supplies, fostering connection. As tension increased, the two clergymen organized lunchtime vigils- for peaceful reflection – at St. Paul AME. The tension at the airport grew as it evolved into a blockade; raising concerns of violence. Some of us floated a suggestion for a redirection of energy from the airport into Hamilton, for a peaceful protest; with a target date of May 1st. In the turbulent circumstances, we could not get formal support for this strategy. However, when BTC employees staged a walkout on the morning of May 1st it offered a platform for that hoped-for peaceful march in Hamilton. This reality was manifested through a spontaneous collaboration, notably involving Sup. Campbell Simons. The march proceeded without any formal permission, as Simons ‘reading the circumstances’, became a ‘drum major’ for the crowd – which grew to 500 people. Through his guidance we peacefully marched for some 45 minutes through the City-centre, with limited disruption. It concluded having released the frustrations that had been playing out at the Causeway. It had demonstrated that peaceful means can be most empowering. Campbell Simons was able to play that pivotal role because he recognized the inherent dignity of all involved. That march on May 1st 1981, ended the danger at the Airport and laid the groundwork for May 5th with its unprecedented unifying gathering, ensuring the peaceful resolution of one of the Island’s most significant crises. In observance of Peace Day, we salute community champions of peace, such as Campbell Simons. In affirming the importance of recognizing the inherent dignity of all, a community delegation will be visiting Westgate on Peace Day to join with some of those persons incarcerated there-in. This, as a reminder of the central importance of that principle. We wish to express our appreciation for the collaboration of the Minister of National Security and the Acting Commissioner of Corrections who have made this visit possible. Everyday should be piece day! We have yet to sign U.N. human rights register of countries who actually indicate officially this posture…no sense posticulating unless you mean what you say!